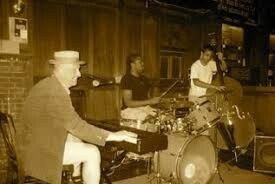 Professor Nohair and the Wiglifters are a fast fingered jazz and boogie woogie piano trio. The band has been playing for 30 years now, born originally from the back three of 9 piece rhythm and blues, jump jive and early soul band The Jivin Instructors who graced the dance halls, pubs and clubs of London in the late eighties. 9pm.